Here, you walk through a should-be-patented Troubleshooting Tree, as well as the macOS built-in troubleshooting application, Disk Utility. You also discover several keystrokes that can make your Mac jump through hoops. Always try a reboot before beginning to worry. Always. If you’re in the middle of a program, try to save all your open documents before you reboot. That might be impossible, but try to save what you can. 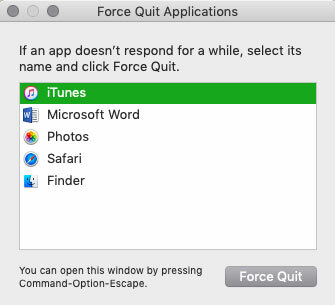 Click the Apple menu, and choose Force Quit. The dialog shown here appears. Click the offending application and then click the Force Quit button. Force a recalcitrant application to take off. Press and hold your iMac’s Power button until it shuts itself off. You have to wait about five seconds for your Mac to turn itself off. After everything is back up, check whether the problem is still apparent. If you use your iMac for an hour or two and the problem doesn’t reoccur, you likely fixed it! Several keys have special powers over your iMac. I’m not kidding! These keys affect how your computer starts up, and they can really come in handy while troubleshooting. After macOS boots, you’re in Safe mode, and you can check the operation of your iMac by using Disk Utility (or a commercial utility application). When you’re ready to return to normal operation, restart your iMac again (this time, without pressing the Shift key). Some of the keys and combinations in the table might never be necessary for your machine, but an Apple technician might instruct you to use them. 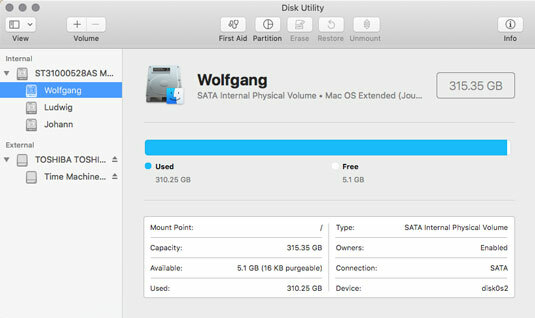 The macOS Disk Utility is a handy tool for troubleshooting and repairing your iMac’s drive — you can use it to check the format and health of both drives and volumes (and automatically correct any problems). You can find Disk Utility in the Utilities folder in Launchpad. Fire up Disk Utility to open the rather powerful-looking window shown here. The physician of drives: the Mojave Disk Utility. The physical drives in your system (the actual hardware). The volumes (the data stored on the drives). You can always tell a volume, because it’s indented below the physical drive entry. Any CD or DVD loaded on your iMac. USB or Thunderbolt external drives. The preceding figure shows that I have one internal drive (the ST3100 entry) and one USB 3.0 external drive (the TOSHIBA USB entry). The hard drive has three volumes (Wolfgang, Ludwig and Johann), and the external drive has one volume (Time Machine). The information in the bottom section of the Disk Utility window is the specifications for the selected drive or volume. This info includes information like the capacity and available space. You may not be able to immediately repair problems on your boot drive or boot volume. This limitation actually makes sense, because you’re actually using that drive and volume right now. If your iMac is having trouble reading a CD or DVD, wipe the disc with a soft cloth to remove dust, oil, and fingerprints. Should that fail, invest in a disc-cleaning contrivance of some sort. Click the Go menu and choose Utilities; then double-click the Disk Utility icon. In the list at the left side of the Disk Utility window, click the drive or volume you want to check. Click the First Aid button, and click the Run button that appears. Click Done to exit First Aid. If changes were made (or if you had to boot from the macOS Recovery HD volume), Disk Utility may prompt you to reboot after repairs have been made. The following figure illustrates the details you see if you click Show Details to expand the display. Although some of the messages might include cryptic Linux details, you can still tell from the figure that the operation is successful (and you get that snazzy green check mark). All is well! First Aid reports that this drive is error-free. As hip-hop artists say, “All right, kick it.” And that’s just what my iMac Troubleshooting Tree is here for. If rebooting your aluminum supercomputer didn’t solve the problem, follow these steps in order until you either find the solution or run out of steps. If you’re not sure quite what’s producing the error, this process is designed to be linear — followed in order — but if you already know that you’re having a problem with one specific peripheral or one specific application, feel free to jump to the steps that concern only hardware or software. Did you just apply an update or patch to an application? Uninstall the application, and reinstall it without applying the patch. If your iMac suddenly works again, check the developer’s website, or contact the application’s technical support department to report the problem. Did you just update macOS? Updating Mojave can introduce problems in your applications that depend on specific routines and system files. Contact the developer of the application, and look for updated patches that bring your software in line with the latest Mojave updates. Did you just connect (or reconnect) an external device? Try unplugging the device and then rebooting to see if the problem disappears. Remember that many peripherals need software drivers to run; without those drivers installed, they don’t work correctly. Check the device’s manual or visit the company’s website to search for software you might need. If you didn’t make any significant changes to your system before you encountered the problem, proceed to the next step. 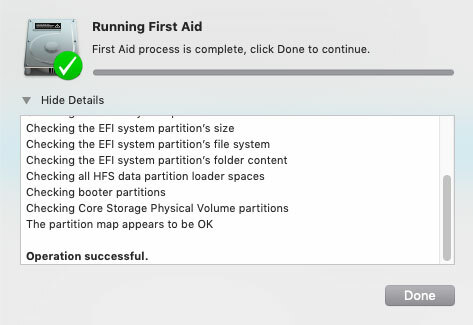 The next step is to run Disk Utility and use First Aid. The earlier section “Repairing permissions and disks” shows how to complete this task on your macOS boot drive. If a Thunderbolt or USB device acts up, swap cables around to find whether you have a bad one. A faulty cable can have you pulling your hair out in no time. Check the contents of the Trash to see whether you recently deleted files or folders by accident. Click the Trash icon on the Dock to display the contents. If you deleted something by mistake, right-click the item in the Trash and choose Put Back from the contextual menu. I know this one from personal experience. A slight miscalculation while selecting files to delete made an application freeze every time I launched it. Now that always-on DSL and cable modem connections to the Internet are the norm, don’t forget an obvious problem: Your iMac can’t reach the Internet if your ISP is down or your network is no longer working! Click the Spotlight icon at the right side of the Finder menu bar, and type Network Utility in the search box. Click the Network Utility entry. If you’ve made it to this point, it’s time to run a full virus scan. Make sure that your antivirus application has the latest updated data files. My antivirus application of choice is Avast Security for Mac from Avast Software. It’s both excellent and free! If a virus is detected, and your antivirus application can’t remove it, try quarantining it instead. This basically disables the virus-ridden application and prevents it from infecting other files. To check the boot process, it’s time to use that fancy Safe Boot mode. Restart your iMac, and press and hold down the Shift key after you hear the start-up tone. Login items are disabled when you’re running in Safe mode, so if your computer starts up without any errors, you know that one or more login items are probably to blame. Select the first item from the list, and remove it. If your iMac is still misbehaving, repeat Steps 2 and 3, and disable a new login item. When your Mac starts up normally, you have discovered the perpetrator. Delete that application, and reinstall it. Don’t forget to add back each of the working login items to the Login Items list using the Add button (which carries a plus sign)! The next step is to turn off your screen saver. This remedy is a long shot, but it isn’t unheard of to discover that a faulty, bug-ridden screen saver has locked up your iMac. If you are running a screen saver other than one from Apple, and your computer never wakes up from Sleep mode or hangs while displaying the screen saver, you’ve found your prime suspect. Click the Start After pop-up menu and choose Never. Click each of the Hardware categories in turn, double-checking to make sure everything looks okay. The Diagnostics category shows whether your iMac passed the Power On self-test.